A green transportation pilot program is being tested on King Street, a central corridor for commuters in the City of Toronto. All year long (2018) the whole of King Street from Bathurst to Jarvis is closed to privately operated vehicles, while bicycles and streetcars are encouraged to use this corridor. The big benefit will be to people living in the area, as the Walk Score for sections along this path will soon be among the highest in the nation. 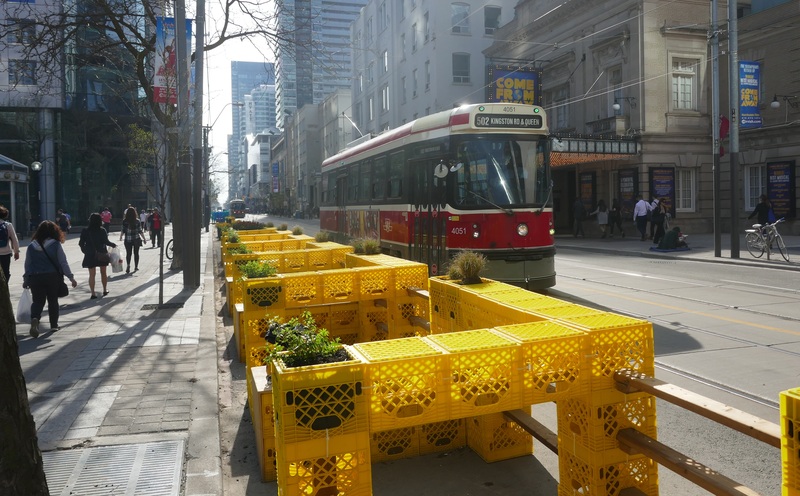 For those of you that don’t know about it, the King Street Transit Pilot was conceived with the intention of moving people more efficiently on public transit, improving public spaces, and supporting business and economic prosperity along King St. The pilot aims to improve the transit reliability, speed, and capacity on the busiest surface transit route in the city by giving streetcars and cyclists top priority from Bathurst to Jarvis. Although there has been much discussion of this environmentally-friendly endeavor for many years, Toronto city planners only launched the pilot in November 2017. Their argument to council was that by banishing private vehicles they could improve TTC travel times and the reliability of streetcars on King, one of its most congested transit routes across the bottom the downtown core. Why do so many people NOT support the King Street Transit Pilot? Toronto Police Services are enforcing the new traffic rules which restrict drivers’ through-movements, forcing them to turn right off King street at most major intersections. (Through-traffic is allowed at Simcoe and York streets, which are one-way and therefore not conducive to right turns off King.) The city has also removed all 180 on-street parking spaces along King in the project area, which runs between Bathurst and Jarvis St. These actions infuriate drivers, especially Uber drivers in their own private vehicles, and they cripple delivery trucks and require construction people to do endless paperwork for special permits for their trucks. The #ReverseKingCarBan is a Twitter hashtag and activist group with many notable members and several local business owners. The most vocal objectors are nightclub and restaurant owners on King between Spadina and University. They strongly object to the ‘green-way’ and the manner in which it was foisted upon them, and they claim their revenues are down as much as fifty percent. They have taken to attacking Mayor Tory personally. But economists believe the move has increased the value of the existing properties and if these business cannot succeed here their premises will soon accommodate those who can make it work. So who loves the new pilot? People do, especially commuters. Every weekday, 65,000 public transit riders travel along King, making it the busiest daytime route in the city. The art on the street is terrific in some installations, but can be underwhelming in other spots. There are now over fifty ‘activations’ or places where street art has been created or installed along King Street between Bathurst and Jarvis Streets, and there is no doubt these curiosities will help add to the vibrancy of the transit corridor project. Most of this art will remain for the duration of the pilot. The TTC and City of Toronto are constantly monitoring and evaluating the success of the project. This scrutiny involves the collecting data before and during and after the pilot ends in order to assess the impacts and benefits of the program. Data is collected through methods such as tracking TTC streetcars using GPS, monitoring car travel times using Bluetooth sensors, and by collecting pedestrian, cycling and car volumes using video analytics. Monthly updates will provide the latest data on the City of Toronto website. Is the King Street Transit Pilot Program a Success or Failure? Its a success. Both the City of Toronto and independent media reports (Toronto Star, Globe&Mail) estimate that the new thoroughfare can take almost eleven minutes off the trip across town at peak times. If you multiply that time-savings across the multitude people who use the route everyday, the effect is monumental, and represents a societal shift and the positive evolution of urban planning over commercial interests more inclined to favour their goods over people. Automobile lovers and drivers all over the city have to change their ways, or their routes at the very least. Maybe this move will cause a million people to rethink their lifestyles? All other routes across the bottom of the city are sure to be at least 10% to 15% busier without King St now closed to privately owned automobiles. Pedestrians have to change too. The zombie-walkers must now adjust their response to changing traffic lights and learn to wait for the walking man signal at crosswalks. That’s because of the changes in signal phasing at many of the intersections within the Pilot Project area. New protected right turn phases have been added to the cycles, meaning that the pedestrian signals that used to switch to ‘walk’ a few seconds after the opposing traffic’s light turned red now have a small delay built in. Despite this new protected right turn phase, many pedestrians are simply ignoring the fact that the ‘walk’ sign hasn’t activated yet and begin crossing the intersection anyway, eliminating the ability for vehicles to make a protected right turn off of King. Like with drivers, this new timing will require a bit of adjustment for pedestrians as well. Construction on the Kingly Condos seen below was well underway when the King Street Pilot Project was announced. The site at King and Portland was something of an obstacle for city planners who welcomed the development, but were now seeking to reduce access at the street address. Cement trucks, dump trucks and heavy equipment haulers were squarely at the other end of the spectrum. Various workarounds were conceived and executed and the big winners here are the buyers who locked into this lifestyle and community, assuming the pilot program yields permanent changes in street design. 543 Richmond St. condominium development is another project that will inevitably benefit by the changes in municipal infrastructure that could result from the test. With this being a Pilot Project, the TTC and City Planners have already stated that they intend to make adjustments and improvements to both the physical infrastructure and the vehicle/traffic signal timing as the project moves along. This bold transit initiative has certainly changed people’s perceptions of King St, and although the Pilot Project is scheduled to run no later than December 31, 2018, the experiment has already, on some level, changed this thoroughfare, and this part of the city forever.